Abraham Maslow is the leading figure in the tradition of humanistic psychology and the modern Positive Psychology movement owes a huge debt to his theories. 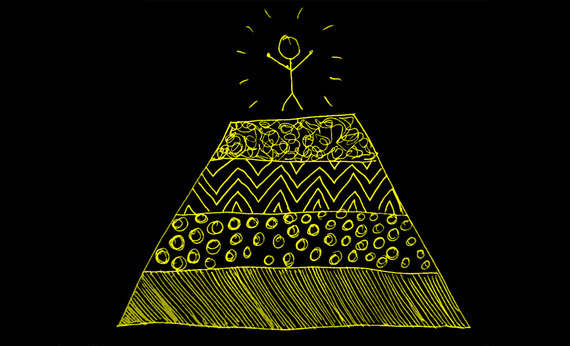 His 'Hierarchy of Needs' remains widely recognized and used. Nonetheless, the layperson knows surprisingly little about the pinnacle Maslow wants us to aspire to- Self-Actualization. Who is this Self-Actualized person, and what characteristics does s/he have? Maslow's portrait is detailed and complex. 1) Self-actualized people embrace the unknown and the ambiguous. 2) They accept themselves, together with all their flaws. She perceives herself as she is, and not as she would prefer herself to be. With a high level of self-acceptance, she lacks defensiveness, pose or artificiality. Eventually, shortcomings come to be seen not as shortcomings at all, but simply as neutral personal characteristics. "They can accept their own human nature in the stoic style, with all its shortcomings, with all its discrepancies from the ideal image without feeling real concern [...] One does not complain about water because it is wet, or about rocks because they are hard [...] simply noting and observing what is the case, without either arguing the matter or demanding that it be otherwise." Nonetheless, while self-actualized people are accepting of shortcomings that are immutable, they do feel ashamed or regretful about changeable deficits and bad habits. 3) They prioritize and enjoy the journey, not just the destination. "[They] often [regard] as ends in themselves many experiences and activities that are, for other people, only means. Our subjects are somewhat more likely to appreciate for its own sake, and in an absolute way, the doing itself; they can often enjoy for its, own sake the getting to some place as well as the arriving. It is occasionally possible for them to make out of the most trivial and routine activity an intrinsically enjoyable game or dance or play." 4) While they are inherently unconventional, they do not seek to shock or disturb. "... the world of people in which he lives could not understand or accept [his unconventionality], and since he has no wish to hurt them or to fight with them over every triviality, he will go through the ceremonies and rituals of convention with a good-humored shrug and with the best possible grace [... Self-actualized people would] usually behave in a conventional fashion simply because no great issues are involved or because they know people will be hurt or embarrassed by any other kind of behavior." 5) They are motivated by growth, not by the satisfaction of needs. While most people are still struggling in the lower rungs of the 'Hierarchy of Needs,' the self-actualized person is focused on personal growth. "Our subjects no longer strive in the ordinary sense, but rather develop. They attempt to grow to perfection and to develop more and more fully in their own style. The motivation of ordinary men is a striving for the basic need gratifications that they lack." 6) Self-actualized people have purpose. "[They have] some mission in life, some task to fulfill, some problem outside themselves which enlists much of their energies. [...] This is not necessarily a task that they would prefer or choose for themselves; it may be a task that they feel is their responsibility, duty, or obligation. [...] In general these tasks are nonpersonal or unselfish, concerned rather with the good of mankind in general." 7) They are not troubled by the small things. Instead, they focus on the bigger picture. "They seem never to get so close to the trees that they fail to see the forest. They work within a framework of values that are broad and not petty, universal and not local, and in terms of a century rather than the moment.[...] This impression of being above small things [...] seems to impart a certain serenity and lack of worry over immediate concerns that make life easier not only for themselves but for all who are associated with them." 8) Self-actualized people are grateful. They do not take their blessings for granted, and by doing so, maintain a fresh sense of wonder towards the universe. "Self-actualizing people have the wonderful capacity to appreciate again and again, freshly and naïvely, the basic goods of life, with awe, pleasure, wonder, and even ecstasy, however stale these experiences may have become to others [...] Thus for such a person, any sunset may be as beautiful as the first one, any flower may be of breath-taking loveliness, even after he has seen a million flowers. [...] For such people, even the casual workaday, moment-to-moment business of living can be thrilling." 9) They share deep relationships with a few, but also feel identification and affection towards the entire human race. "Self-actualizing people have deeper and more profound interpersonal relations than any other adults [...] They are capable of more fusion, greater love, more perfect identification, more obliteration of the ego boundaries than other people would consider possible. [...This devotion] exists side by side with a widespreading [...] benevolence, affection, and friendliness. These people tend to be kind [and friendly] to almost everyone [...] of suitable character regardless of class, education, political belief, race, or color." 10) Self-actualized people are humble. "They are all quite well aware of how little they know in comparison with what could be known and what is known by others. Because of this it is possible for them without pose to be honestly respectful and even humble before people who can teach them something." 11) Self-actualized people resist enculturation. "make up their own minds, come to their own decisions, are self-starters, are responsible for themselves and their own destinies. [...] too many people do not make up their own minds, but have their minds made up for them by salesmen, advertisers, parents, propagandists, TV, newspapers and so on." Because of their self-decision, self-actualized people have codes of ethics that are individualized and autonomous rather than being dictated by society. "They are the most ethical of people even though their ethics are not necessarily the same as those of the people around them [...because] the ordinary ethical behavior of the average person is largely conventional behavior rather than truly ethical behavior." 12) Despite all this, self-actualized people are not perfect. "There are no perfect human beings! Persons can be found who are good, very good indeed, in fact, great. [...] And yet these very same people can at times be boring, irritating, petulant, selfish, angry, or depressed. To avoid disillusionment with human nature, we must first give up our illusions about it."